Activists supporting the call for justice following the assassination of Daphne Caruana Galizia have found a way to leave their mark at the Great Siege monument by attaching padlocks to the surrounding fence. For the past year, all the candles, plants and photos left at the site have been cleared away almost immediately, over 200 times. Just hours after the monthly vigil on Wednesday, the tributes and calls for justice were once again cleared up. The issue has even ended up in court, and has generated a number of aggressive outbursts. 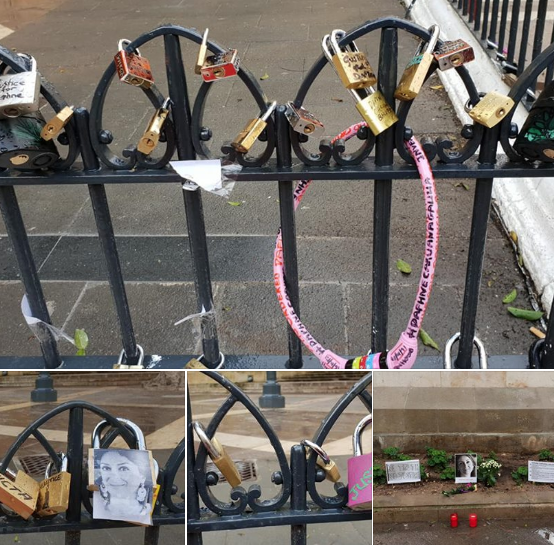 But the activists from Occupy Justice and il-Kenniesa, who held their monthly vigil in Valletta on Wednesday to mark the 16th month since the gruesome murder also left their messages on padlocks attached to the fencing around the monument. One activist wrote on Facebook: "Shout out again to Il-Kenniesa, padlocks are a brilliant idea and there are so many creative things that have been done to them. All tributes from yesterday's vigil are gone. This is now #daphnecaruanagalizia#occupyjustice."